With fixture congestion over with, the lineup put out by Chris Armas was exactly what you expect down the stretch. All the regulars were back, meaning a cohesive defensive performance was expected. We didn't exactly get it. The Scum opened the scoring in the 25th minute off a Metro turnover at the right sideline. The ball was swung over to Paul Arriola, and the usually on-time Kemar Lawrence was late, DC converting from top of the box. Metro evened it in the 41st, after the always-awful Bill Hamid flubbed a ball. It went into the air, where BWP pulled it out with an overhead kick, depositing into the corner of the net. The Scum got the lead back in the 64th, after an unmarked Wayne Rooney one-timed from the penalty spot. But Metro responded eight minutes later, when Michael Murillo found BWP at the top of the box. The wonderful Englishman slit the ball through the defender's legs and into the bottom left corner. The Scum looked to have won it in the 87th, when Luciano Acosta dribbled through the box and scored from close range, with Murillo hopelessly lagging behind. But BWP had the final say. A long ball from Aaron Long found Alex Muyl at the edge of the box. 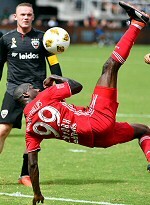 The midfielder took it to the endline and crossed to BWP, who smashed the ball across his body and into the net. It was Wright-Phillips' fifth hat-trick for Metro, and his first since 2016. In injury time, VAR had to be consoled when Muyl looked to have handled the ball in the box, but reviews were clear that it went off his chest, and the score remained. So, should we be too happy about this game? The defense allowed three for the second straight match, and Metro is now a points back of Atlanta for the Shield. Errr... we're happy. We liked this tie. Lineup: Robles, Lawrence, Long, Parker, Murillo, Adams, Davis, Rzatkowski, Royer, Romero Gamarra, Wright-Phillips. Subs: Muyl, Ivan, Lade.